Ask Yourself, Where Do You Want to Go? What Do You Want To Do? This is my story, something that happened long before I was aware of how manifesting works and later wrote a book about it. Years ago, I worked at a large gallery in Houston and when that ended, the architect next door recommended that I sell something they use a lot of: glass, furniture, wall coverings, carpet, etc. After looking around, it seemed the carpet idea would be a good place to land a job for a time. It wasn’t as easy as it looked, but I was with a company that did a lot of large, commercial work, giving me access to some large contracts to bid on. After a time, my experience grew and I was in the middle of a massive carpet sale and install contract for a large retail mall in town. The project created a lot of buzz with a number of carpet manufacturers that wanted to supply the goods. It took months of working with those manufacturers directly and they were watching how I was handing the competitive bid process with them all. I did get that big contract and with it, a call from a manufacturer’s VP. His company didn’t supply the carpet we used, but he was interested in the possibility of my working for his large, national firm. A time was set up and he flew in for an interview over lunch. Since I was 17, the art business was like a home to me, the picture framing shops at first and then as a gallery manager. Although I met a number of wonderful people in the carpet business, it was not an appealing vocation compared to the fun I had in the art business. During the interview, the VP explained that the territory being offered would be the central US and it would require constant travel during the week. This was pre-internet, so having one of those thick airline schedule paperbacks was required to serially book flights every day. I was beginning to zone out hearing the complexity of it and there was the other factor that carpet is a lot less interesting to sell compared to artworks. I think the VP detected that I was drifting away. The answer came back quickly without my thinking it and surprised me to hear it. “I want to be an artist.” Well, that was that and I can’t remember another thing that happened at that lunch but I didn’t forget what I said that day. Did I act on it right away? No…. like so many of us, it became a “gonna, fixing to” kind of thing. But a couple of years later, I bought a how to draw book, got a note pad and pencil then started to teach myself. Since I had years being around pretty good to great art, I had an idea of what good art should look like, good to know but not very helpful for making it. I had to stay with it and get better day by day. During the day I worked other jobs but I stayed focused on the idea of being an artist, drawing and painting when I could. That focus resulted in two very big breaks. A friend told me to apply for a month-long class with the esteemed artist Wolf Kahn at the Santa Fe Art Institute. I knew Wolf casually and happily, I was accepted. He told me I was accepted on my merits as an artist, a kind thing to tell a new artist of few skills. Looking back, that month was fundamental to my progress as an artist and I use what I learned there every day. After that class there were more occasional sales of small things. It was encouraging to see and I began to spend time after the workday in the struggle to make better artworks. My wife at the time, Linda offered that my day job wasn’t bringing in a valuable or necessary wage and she recommended that I quit the little job and start making art full-time, a Very Big break. Thank you, Linda. Now I start each day stating 7 grateful things, and there is much to be grateful for, including these two big breaks. Looking back, I recall the initial catalyst. A stranger asked me a simple but incredibly important question, “If you could do anything in the world you wanted to do, what would it be?” My answer provided a direction, the focus was up to me. Now I’m asking you the same question. 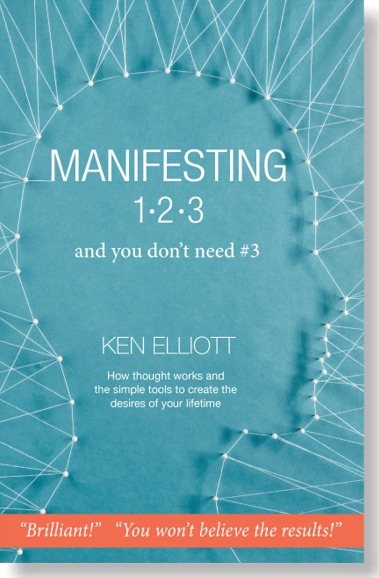 Manifesting 1,2,3 and you don’t need #3 shows you what your thoughts can do. Now you have the tools to make things happen. Your book is the best I have read, and I do read this subject. Simple, covers all the bases with humour and clarity. Great job! Great resource and I thought I was ‘done’–not quite it seems, so thanks.